The fall season is beginning to draw to a close, and the first show to finish up is the excellent Silver Spoon, or Gin no Saji. Chronicling the high school adventures of Hachiken Yuugo at Ezono Agricultural High School, this anime with a seemingly strange premise is from the writer of Fullmetal Alchemist and lived up to EVERY expectation I had. 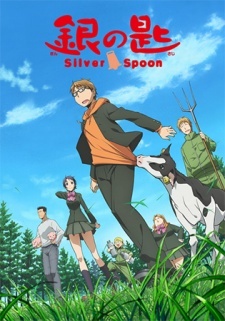 Silver Spoon is a show all about farming, which means it has three main themes. Food, animals, and food. How do you make a compelling story out of that? With excellent writing. The show is written masterfully, and all season long I would finish an episode and go, “Wow. That was perfectly written.” The coming of age story has been done over and over again, but Hiromu Arakawa puts a spin on it that I have never seen before. Hachiken, who was a perfect student in middle school, is initially way out of his element at Ezono. He’s never really been around animals before; all he knows how to do is study. But he is immediately faced with the challenge of realizing the pigs (specifically a runt, whom he names Pork Bowl) he is raising will soon be slaughtered for food. Taking the life of anything is serious, and even at the end of the initial 11 episodes, Hachiken still hasn’t completely come to terms with the matter. The impressive thing is how we are simultaneously allowed to explore this issue ourselves, while watching Hachiken makes his own judgements and decisions. His realizations and struggles form the backbone of his character arc, and the excellent writing draws the audience into the discussion. Now, this isn’t to say that Silver Spoon is all serious and no fun. Episode 5 stands out as a hilarious gag episode in which the boys go on a quest to see what turns out to be…a giant tractor. I’m not a farmer, but my dad was raised on a farm and this anime gets the enthusiasm for farm equipment exactly right. Overall, the humor is well-placed and balanced with the more serious moments. Another impressive trait of the anime is the care it takes in presenting different aspects of the farming lifestyle. Each episode is bookended with a short notice on the show’s grounding in real life and the representations in between, to my knowledge, are pretty spot on. Farming is a tough lifestyle, and Silver Spoon takes a serious look at the ups and downs that come with it. Besides Hachiken, Gin no Saji is populated with an ensemble cast of bright, interesting characters. The show makes a big deal out of the nature of dreams, contrasting Hachiken’s aimless and confusing search with the confidence, insecurities and pressure with which the other students at Ezono are dealing. From family expectations to fear of failure to absolute conviction, Haciken’s classmates each have their own stories and none of them feel arbitrary to the story. A-1’s animation (same studio as Servant x Service and Sword Art Online) is crisp and clean, although it’s nothing really special. Both the OP and ED song are catchy pop tunes, tinged with just enough American country to make them perfect for the show. 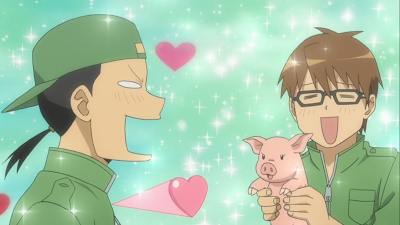 You can’t go wrong with Silver Spoon. It’s an enjoyable, fun watch and lacks anything objectionable. The storytelling is top notch, as are the characters. The themes explored are relevant beyond the farming life, and it’s a genuine pleasure to watch Hachiken grow throughout the show. From top to bottom, Silver Spoon is the definition of quality storytelling and classy production. To see where Silver Spoon fell in my ongoing rankings, click here. Excellent writing that never takes breaks and always delivers. A genuine lack of sexual fanservice, which is a breath of fresh air in the current day. Believable characters exploring meaningful themes. Thanks for reading through to the end, and subscribe through WordPress, or by email on the left side of the screen!